Sut ydw i’n mynd i Llanfairpwllgwyngyllgogerychwyrndrobwllllantysiliogogogoch? 1) Look at them with wide eyes, think they had started speaking in tongues, stutter a few incoherent words and run away in horror. If you answered with number one, then you’ll probably want to back away slowly, make some cheese on toast and stay away from my blog for the next week. If you answered with 2, 3, 4 and 5, then WELCOME TO WELSH WEEK or should I say (possibly incorrectly*) CROESO Y WHYTHNOS CYMRAEG. Go and make some rarebit, make a panad and join me as I celebrate everything to do with this glorious country. If you’re familiar with the land of Wales, you may know that 1st March is St David’s Day (Or if we’re being Welshically correct Ddyl Gŵyl Dewi! )and I wanted to do a little something, something for it…. You may know that I spent three years drinking and avoiding deadlines like a ninja studying at Bangor University, so Wales will always have a special place in my heart. Also, my granddad on my dad’s side is from Gwynedd so it truly is the…. land of my fathers. So, even though I now live across the border in the land of lions, I still think of the land of dragons fondly and I miss it terribly. I have decided that in this week leading up to St David’s day, I will be only reading books either written by Welsh authors or books that are set in Wales. I’ve roped in a few of my friends [in particular Ceri, who is from the land of Tom Jones Wales who has strived endlessly helping me with translations to help me along the way and to come up with the “Fun Welsh Word of the Day!” feature that you will see at the bottom of each post] so you will be seeing what exciting things they have to offer. Also, don’t forget to check back at the weekend for an explosion of all things Cymraeg! What’s in a Name? by J. Anderson Coats. Motorcycle Emptiness || A Design for Life by The Manic Street Preachers. Something 4 the Weekend by Super Furry Animals. Rain on Your Parade || Mercy by Duffy. Total Eclipse of the Heart || I Need a Hero by Bonnie Tyler. [I wish you could see the shapes I manage to get my body in when I dance to these songs. Bloody anthems. The Welsh sure know how to make epic songs. Something Inside So Strong by Uncle Bryn. Also, to keep this post relatively relevant. 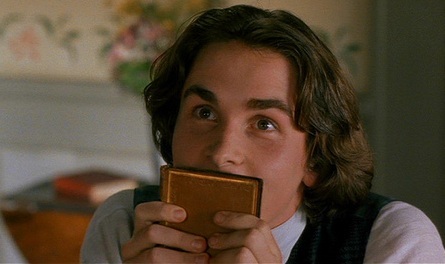 Did you know that Christian Bale is Welsh? Oh no look what happened. Any excuse to get some Laurie involvement. And it’s YA. IT COUNTS. Fun Welsh Word of the Day! Pronunciation: Us – bee – en – th – r (roll it) – i (like the ‘i’ in ill)- ch. *You should probably get used to me butchering the language this week. I’m still a learner and a shoddy one at that. I can’t even roll my rs! I’d be a horrible Welsh person. Hwyl to you on your Welsh week!!! You can always count on an American to botch your language. You're welcome, people of Wales. ps. Don't worry. The Welsh have had lots of practice with being polite when a foreigner tries to speak it. :-D You should have been there when I tried to say Llfair P.G (as it's often abbreviated!) once. I've been following your blog for a couple months now (and loving it), and I thought I'd chime in because I'm so excited about this! I'm American but deeply obsessed with all things Welsh, and I've never read any of the books you listed, so I'm looking forward to hearing about them! I really hope you enjoy this feature as much as I am. Wales will always have a special place in my heart! If you have any Welsh literature recommendations I'd love to hear them!